Note: There are currently no new wall calendars planned. A photo wall calendar created in collaboration with a number of photographers around the world. Includes month names in Arabic (transcribed) and the respective language, Badí‘ weekdays (as well as Gregorian weekdays for easier reading), Holy Days, and Gregorian dates corresponding to the beginning and end of each month. 20 pages in high-resolution A3. For printing at home or at a print shop of your choice. You may download and print the calendar for yourself and others. 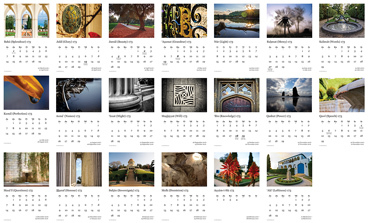 You may not use the photos in the calendar for any other purpose without explicit permission from the authors. Copyright on all photos remains with the original authors. You may not sell the file or a printout for a profit. You may not edit the file in any way, especially to remove or obscure the copyright information. The file may not be hosted on any website other than www.badi-calendar.com without permission. By downloading any of the files below you agree to the above conditions.